Last week I failed to share a Monday book list. Sometimes real life overwhelms my schedule, sometimes I’m waiting on a few books to come in from the library before adding them to a list, sometimes I just need a short break. To make up for my lapse, I knew it would be fun to hear what YOU are reading to your kids. So I asked on my facebook page (you know you want to like us) what books your children are naming as their current favorites. I’m so glad I did because I now have some great new recommendations. Unlike my other lists, I have not read all of these books and thanks to you (yay for facebook fans), my library holds list is once again full to the brim. If you didn’t get a chance to add your child’s favorite to my query on facebook, take a moment, leave a comment and tell us: what books are your kids currently obsessing over? Little Blue Truck and Little Blue Truck Leads the Way . These books were named by several people as their kids’ favorites. I’m not surprised, these cheerful, rhyming books have been favorites in our home, too. There’s a lot to love about a friendly truck who saves the day. Doodleday . I am so glad Jackie of My Little Bookcase mentioned this one as her child’s current favorite because we love it too! It’s a clever story where art (literally) meets real life and (as usual – ha ha) mom steps in to save the day. Harold and the Purple Crayon . A true classic. This is would be a great book to pair with Doodleday (above). Wonder Bear . This gorgeous book made it onto my 15 Wonderful Wordless Books post a few weeks ago. I’m so happy to hear it was one of your favorites, too. It’s a magical, imaginative adventure. Elephant and Piggie. Mo Willems’ Elephant and Piggie easy reader series is so funny and both my boys have enjoyed many of them. The mom who suggested these books also named several of Willems’ other works, including the much loved Knuffle Bunny, which I have a soft spot for since it was photographed in our neighborhood! Shark in the Park. This one looks like it will produce a lot of story time giggles. It has rhyming text to help with phonics understanding and flaps for a bit of interactive reading fun. The Little Mermaid. One mom mentioned her child loved The Little Mermaid. I wasn’t sure which edition she meant, but I found this gorgeous pop-up book that is coming out later this year. There is also this lovely-looking version of Hans Christian Anderson’s classic tale illustrated by Lisbeth Zwerger, who has illustrated several of his stories. Chased By Sea Monsters. I love that someone mentioned their child became obsessed with this book after watching a film. It is the perfect example of how we can feed our children’s interests with books. And also how their interests can be quite extraordinary. Herb the Vegetarian Dragon. Another new to me book. This one’s about a dragon who would rather eat veggies than princesses. Sounds like a proper diet choice to me. The Boy Who Grew Flowers. As soon as I read the description for this one I put it on my library list right away. It’s about a boy whose body grows flowers during the full moon. He thinks he is alone until he meets a girl, who is special like he is. It’s about accepting people for their uniqueness. Nim’s Island. I’ve not read this one (or seen the film), but I’m glad it was given a shout out since I really enjoyed Wendy Orr’s Mokie and Bik books. It looks intriguing and good for kids who like Swiss Family or Robinson Crusoe-like adventure stories. Has anyone else read it? The Wind in the Willows. Kenneth Grahame’s classic tale is also on my picnic book list. It would make a lovely summer read aloud, especially if you are lounging on a grassy knoll next to a picturesque river (dare to dream). You can download a free copy from Project Gutenberg. The Folk of the Faraway Tree and The Adventures of the Wishing-chair . Enid Blyton is a nostalgic choice for many. Surpisingly I never read her books as a kid, even though they are exactly the sort I would have enjoyed. I have loved discovering them as an adult and these are two I have yet to read. Do you have a favorite Blyton book? The Zombie Zone (A to Z Mysteries) . The A to Z Mysteries series is a popular early chapter book series which has spawned several spin-offs. As you might guess, there are 26 books, one for each letter of the alphabet. Megan of Coffee Cups and Crayons named this as her child’s favorite. I’m guessing he’s looking around for a new series to start. Fortunately, (hee hee) I’ve got a list: Early Chapter Books, Mysteries. Even Monsters Need Haircuts . I don’t know this one, but the artwork is cute. A young barber steps into his father’s shoes to help out some unusual clients. The reviews indicate the book would be good for addressing childhood fears and overcoming anxiety. I look forward to reading it. The Marshmallow Incident . I wish I knew about this book when we were making s’mores! It’s by the team who brought us wonderful books like Cloudy with a Chance of Meatballs and Animals Should Definitely Not Wear Clothing. I’ve never read it, but it looks hilarious. This recommendation came from Carolyn of The Pleasantest Thing. 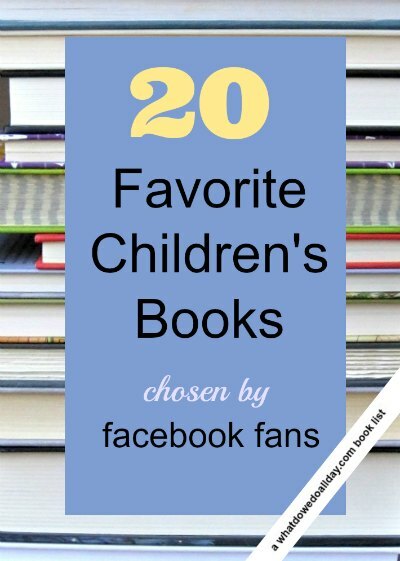 Is your child’s favorite on the list? Don’t be shy! leave a comment below and tell us. Disclosure: Including affiliate links (at no cost to you!) underwrites the time it takes me to make these free lists and share them with you. Thanks for continuing to support this blog. Great list. My child’s favorite is usually the book she is reading right now. At the moment it’s Percy Jackson and the Olympians – she is currently on the last book from the first series. My personal recent favorites were The Penderwicks and Where the Mountain Meets the Moon. Great list! My 6 year old loves Charlie and the Chocolate Factory, Charlotte’s Web, Clementine, Flat Stanley’s Worldwide Adventure, Magic Treehouse and the Ramona books. I’m always looking for other great books that work for her reading and age level and it is definitely a challenge! Thanks, Michelle. I made a few lists for early chapter books that might be useful for your 6 year old if you get a chance to check them out. We love these books lists! My 4 year old daughter loves anything by Julia Donaldson – The Gruffalo, What the Ladybird Heard, etc. My son, who is 6.5 yrs old, still loves Geronimo Stilton and the Magic Tree House series. He is also just about to start Mr. Popper’s Penguins. So glad it is summer time, so we can read more books! Excellent additions to the list! I know this post is years old, but I figure others might still be interested just as I am. A few of my just turned 2 year old’s current favorites that I don’t see mentioned frequently are Ben’s Trumpet (he loves pretending to blow a trumpet), Little Dog Lost, Where’s My TRUCK? (the illustrations in this weird me out, but hey, he loves it), egg by kevin henkes, and Baby Cakes (he loves cooking).